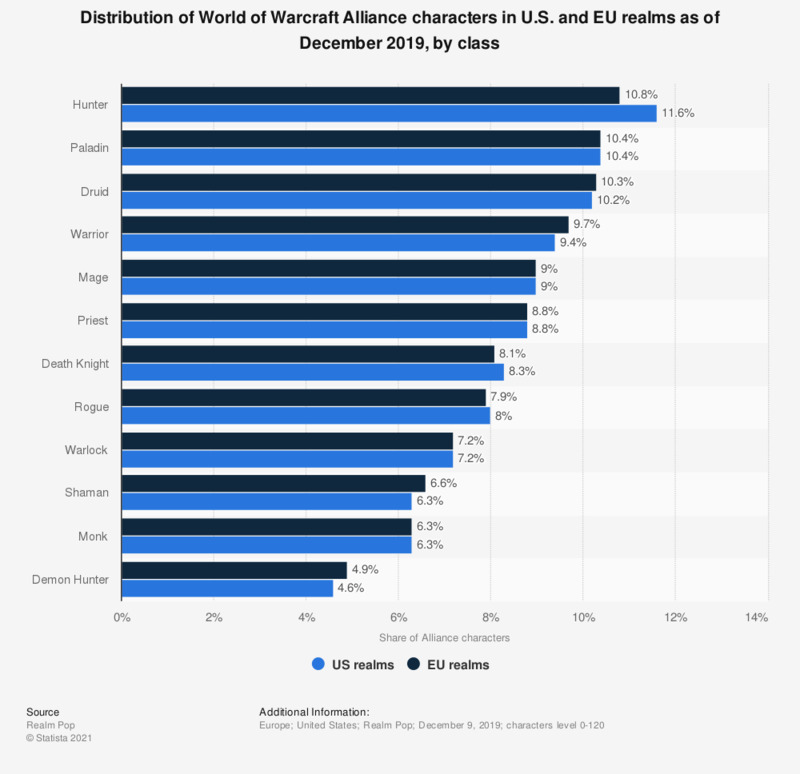 The statistic shows a distribution of the Alliance classes in the online computer game World of Warcraft as of February 2019. Approximately 11.6 percent of all Alliance characters in U.S. realms were Hunters. Overall in terms of class the majority of players chose Hunters, and as for race, the most popular choice in the series was Human. World of Warcraft, the massively multiplayer online role-playing game, was originally published in 2004 by Blizzard Entertainment for PC. The game has since released 5 expansion packs, the last one being in Fall 2014. World of Warcraft has developed into one of the top earners for Activision Blizzard, which is the parent company for Blizzard Entertainment. In 2013, Activision Blizzard generated a revenue of 3.45 billion euros, ranking fifth in the top game publishers based on revenue and sales. Consumers were given the option to either purchase a physical copy of the game or to download a digital copy from Blizzard Entertainment’s online store. However with the increase in internet speeds over the years and the development of more stable online platforms, such as Steam, gamers are beginning to rely on digital game downloads, rather than going to a retailer. In 2013, an estimated 28 billion euros worth of digital games were sold, compared to only 16.2 billion euros of physical games. In the United States as of 2013, more consumers played free to play MMOs rather than subscription MMOs. Ten percent of respondents said that they played a subscription-based RPG like World of Warcraft, while 14 percent of respondents claimed to have played a free to play MMO.